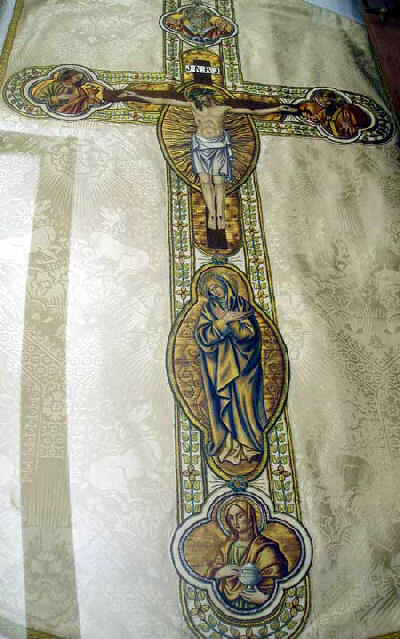 Crucifixion Chasuble: Historical Needlework Sample – Gorgeous! Here’s another example of ecclesiastical embroidery – a chasuble of the Crucifixion, worked entirely by hand, with embroidery and goldwork. 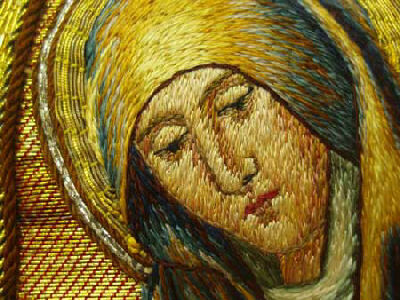 It is really stunning – the “needlepainting” techniques that achieve the shadows and shading are so expertly done that, from a distance, it’s difficult to realize that the piece is embroidered. 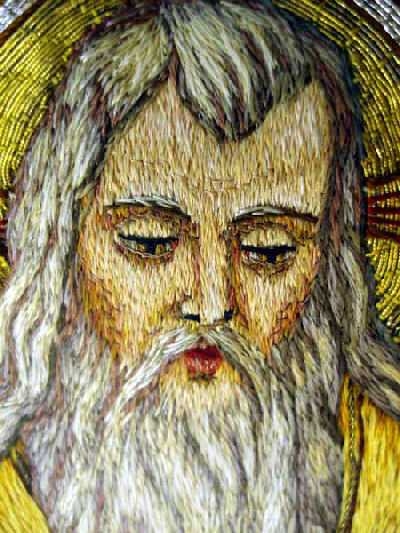 I’ve included here several close up photos so you can see the range of colors used in this exquisite piece of historical church needlework. This piece is housed at the Benedictine Convent in Clyde, Missouri, which I explained about previously when displaying photos of an embroidered cope. The vestments on display at this convent are all behind glass – some in drawers, with a couple exhibits in large, walk-around display cases. This particular piece was lying in a drawer behind glass, so only the back was available for viewing and photographing. This is as full a shot of the chasuble as I could take. To give you the basic layout, underneath the crucifix is Our Lady of Sorrows (Mary, the mother of Jesus), and underneath her is St. Mary Magdalene. 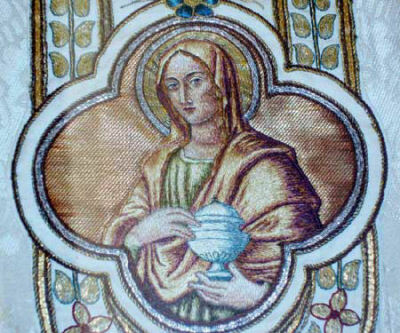 The vessel in Mary Magdalene’s hands is indicative of the oil she annointed Christ’s feet with when she washed them with her tears and dried them with her hair. At the right arm of Christ crucified (so, on the left side of the photo) is St. John, the “beloved” apostle, present at the crucifixion along with Mary, the mother of Christ, and Mary Magdalene. On the left arm (so, on the right in the photo) is …. ? I don’t know – perhaps St. Peter. It could also be, perhaps, St. Benedict, as it’s a Benedictine convent. At the top of the Crucifix is God the Father and the dove symbolizing the Holy Ghost. Design-wise, this chasuble is lovely. The color schemes are pleasing, the symbolism is thought-provoking (as it should be), and the embellishment of the embroidery (with the goldwork) enhances, not detracts, from the needleworked scene. It’s quite stunning work! This is amazing – it’s the coloring and shading that capture the eye. The gold and blue work together so well! The realistic folds and shadows are stunning! Here is a close-up on the face, where you can really get a good idea of the gold and blue shading. Note also the eyes, the smooth stitching on the face, the two tones in the mouth (so the lower lip is shaded). The smaller insert of Mary Magdalene is not as exquisite as the one above, but some details – especially the expression on the face – are not to be missed. A lovely smaller piece. 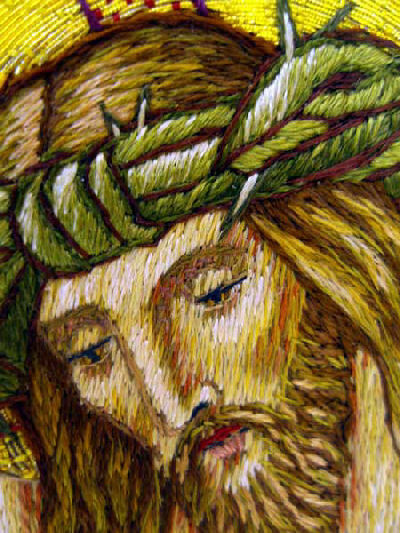 If you look at the crucifix from a distance (above), and then look at the photo below – the close up on the face of Christ – you will see that “impressionist” appearance in the needlepainting. If you’ve ever looked at an impressionist painting up close, you see the strokes and rather a jumble of color, but when you step back, the effect is much smoother. Look at how many colors are used to produce the face! These people really knew the art of needlepainting! Check out the rose, the red, the yellows, the greenish-browns – all work together to create a very “smooth” face from a distance – perfectly placed shadows, and very realistic. 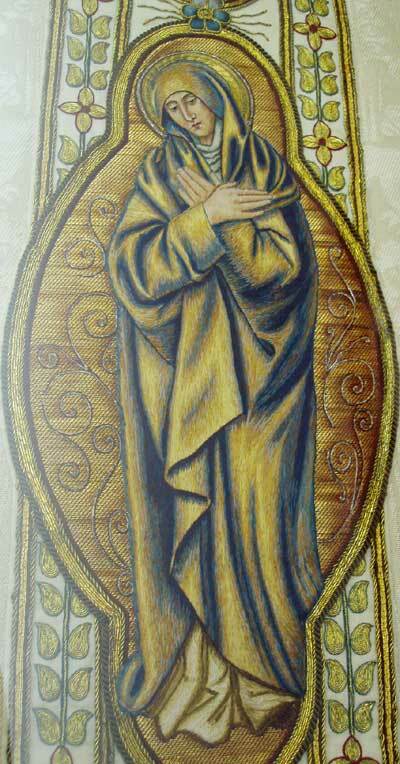 This is the image of St. John. I’m not sure why the snake in the cup – undoubtedly an image of temptation of sorts, but I don’t know the details of the story behind it. The flash really reflected on the glass here, so the photo isn’t as nice as I could wish! 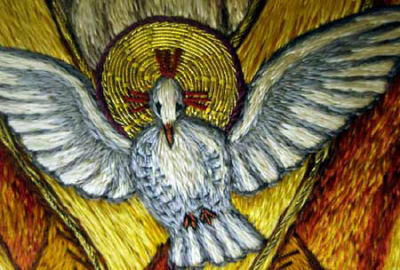 The dove symbolizing the Holy Ghost is incredibly detailed for something so small – approximately 2.5 – 3 inches across, tops. 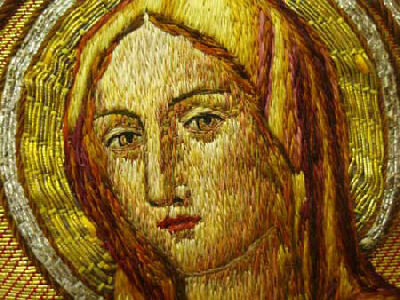 Note how the goldwork is couched on the halo – it’s not “bricked,” but rather creates a “sweeping” circular movement. Again, the color selection for the face is amazing. Also, the detail in the hair and beard is exquisite. Note the stitch direction in the cheeks – the horizontal stitches create the shadow. 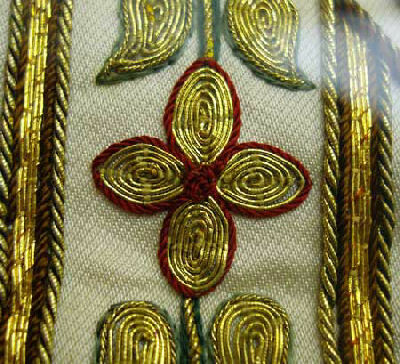 And finally, here’s a close-up on the goldwork that embellishes the whole piece. I hope readers enjoy seeing this stitching close-up! It really is amazing work! Imagine the understanding of colors and the artistic sense that each needleworker who contributed to this had to possess. What an art! Thank you for showing us this piece Mary. It is absolutely stunning work. Thanks, Mary. It’s great to be able to see a contemporary work of great opus Anglicanum-like art. Amazing, indeed! Excellent look at both silk shading and goldwork. Thank you so much for showing this. It is amazing work and so moving too. history has been studded with such fine art,AMAZING!!! 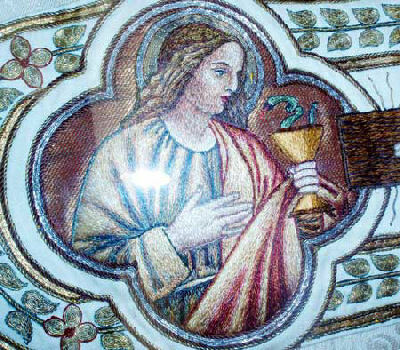 The serpent in St. John’s chalice is an allusion to the cup of sorrow foretold by Christ. It could also be related to Emperor Dometian’s attempt to poison him. This is an unbelievable piece. Is it the work of a single artist or a group, do you think? I’ve never seen impressionistic needle painting before; is it usual? Thank you so much for making these available to us. I guess it isn’t technically “impressionist” – it just reminds me of that because close up, it isn’t as clear as it is far away, because you see the various stitches. It is a beautiful piece, isn’t it? Undoubtedly, it is the work of a group – Benedictine Sisters, actually. Thankyou for the analysis as well as the close up look at such a stunning piece. 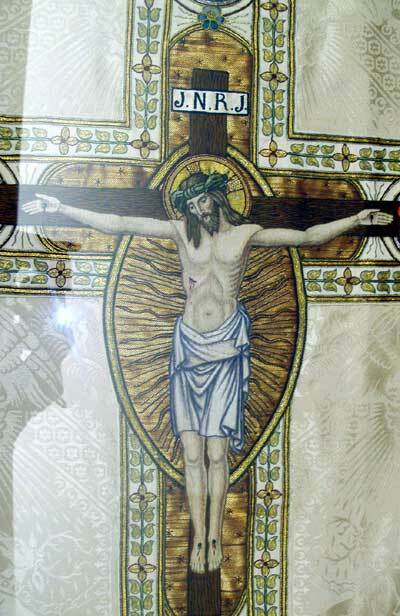 Viewed for the first time the Crucifix embroidered. Undoubtedly the embroidery is awesome and what a beautiful gift to be able to have this talent. More importantly though is what is seen with the mind, heart and soul. Someone’s smiling down on you and it probably isn’t the Easter Bunny. Do you know how long a piece like this usually took with a whole band of nuns working on it? Do you have any information on where other needlepainting pieces are in the US, or in Europe, for that matter? That is just lovely. I had no idea that that amount of detail was possible! Chances are, the individual elements of the design – like the Virgin, and the three characters in the medallions, would most likely have been worked on separate frames, on linen, then applied to the vestment, then the background worked. So more people could be involved that way, too. I don't have a list of places that still house such works. I wish I did! This just took my breath away! Words can't express how beautiful this really is!! Unbelievable.. I am a stained glass conservator and I am struck by how much the colors on this embroidered piece resemble the truly old silver stained glass painted figures. When stained glass was first used the common ways to alter the glass color and affect shading on clear glass was by dark shading and tracing paints in browns and black, and the lovely golden yellows created by using “silver stain”, a powder made of silver nitrate that actually stains the glass in varying shades of gold. Check the internet for examples of such painted glass and you will see what I mean. I found your site 2 days ago, and I’ve learned more hand stitches in these 2 days than I have in a year of reading embroidery books! As a child, I was never interested in my mother’s counted cross-stitch, but as an adult I have become a reenactor in the SCA. I specialize in 16th Century England, so learning Blackwork was a must! I’ve been working Holbein stitch designs for 2 years now, in both DMC and flat silk with metallic highlights. But with help from your fabulous online tutorials, I’m ready to move on to a coif with stem stitch, French knots, chain stitch, and buttonhole. I was already good at Pekingnese stitch, but now I may add whipped backstitch, or an underwoven variation of Palestrina stitch for texture. You’ve also answered my questions about goldwork through your detailed blogs, so I’m going to add some silver to my next project! I don’t have a list of places that still house such works. I wish I did! do you know who did this? it’s awesome! This is incredible I am amazed and astounded. It is truly and gift from God to behold such beauty. Thank You, Thank You for sharing this! Beyond Beautiful…The time that is put in these projects is unimaginable!! Mary I thoroughly enjoy your website and your newsletter. You’re right the shading on both are exquisite, it just amazes me the artistry of these vestments.